Majestic mountains, aquamarine waters, sugary beaches and dramatic sunsets create the ideal backdrop for couples. We invite you to be part of the lush scenery and explore the Islands of Tahiti, often called the islands of romance. Adventures range from four-wheeling across lush valleys and waterfalls to diving, snorkeling, canoeing and hiking. Gourmet French cuisine and overwater bungalows are the hallmarks of this paradise, ideal for rejuvenating and reuniting. From the iconic views of Bora Bora, to the warm secluded lagoons of Fiji and Cook Islands, travelers will find true paradise. 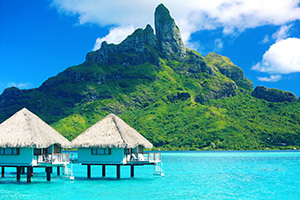 Tahiti – Moorea – Bora Bora – The three most popular islands in the South Pacific that evoke a peaceful state of mind, romantic honeymoons in an overwater bungalow and vacationers looking to escape and unwind. Located in the heart of the South Pacific halfway between New Zealand and Hawaii, this country of 15 islands is secluded and off the beaten path. The Cook Islands are renowned for their idyllic climate, white sandy beaches and spectacular scuba-diving sites. The largest island, Rarotonga, features volcanic peaks, rainforest and coral reefs. North of Rarotonga is Aitutaki, nicknamed the Honeymoon Island, with crystal clear lagoons and superb beaches. Rates are based on roundtrip air travel to/from Los Angeles (LAX) and are per person, based on double occupancy. Advertised vacation rate(s) valid for Saturday departures 1/11 - 2/28/20 for Cook Islands, daily departures 11/1 - 12/2/19 for Fiji and Monday, Tuesday, Friday and Sunday departures 11/18 - 12/6/19 for Tahiti. 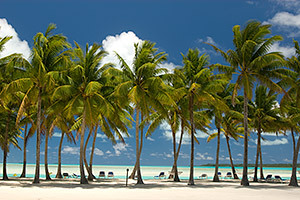 Cook Islands - Exclusive $250 OFF per booking Offer: Valid on new bookings made 4/22 - 7/28/19 for select travel 4/22 - 3/31/20. Minimum 5-night accommodations at participating hotel or resort and roundtrip transpacific airfare required. Offer not combinable with all specials and may be changed or withdrawn at any time. Savings is per booking and taken at time of booking.